* Do not use for other than suitable size of automobile and motor bicycle. * Cut the head of pins and use since burden of cutter pin is large when using for series 50 and 60., * Do not use for other than suitable size of automobile and motor bicycle. * Cut the head of pins and use since burden of cutter pin is large when using for series 50 and 60. 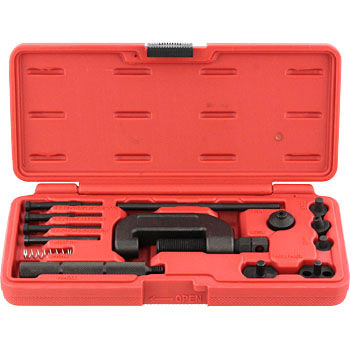 Chain Cut and Revet Tool Accessory Set, "Kashimaru Kun R #40"
There is no problem with the cam chain cut. It seems compact and easy to use. This review is about item#3277304. It was broken by the first use for the first time ..... Unfortunately it was a waste of money. I purchased it for bike chain exchange, and after removing a 530 size chain with a grinder, I removed the pin. I was able to press fit and squeeze. It is good to have a manual with pictures, but it is good to check it on YouTube before working. We bought for mini bike chain. As it is used less often, this is enough for me. You can use it without any problem. It is (possibly) the same as a certain branded product. The difference is whether there is a little more detailed manual, or is it that the product of a certain brand has a setting of repair parts. Since it was written that the pin seems to break easily as I looked at other reviews, I used it on the net before using it. Although I finished the replacement work without damage, I feel confused that the first one feels confused, I think that it is hard to understand although a simple instruction was entered. I think that it is good if you can purchase pins individually for those who have broken. I have not used it yet. It seems easy to use as seen. I am satisfied that it is cheap and can be purchased. Because the outer diameter of the chain link press-fitting plate is small and the plate turns, delicate press-fitting work becomes very troublesome. Other than that it could be used without major problems if you pay attention. I used it for the chain of 530, but I could use it without problems. I think that it will cause breakage etc. if I do not use it understanding this part because it is necessary to cut the caulked part with thunder etc. at the time of chain cut. Although it may not be for amateurs, I think that it is a commodity suitable for the price.